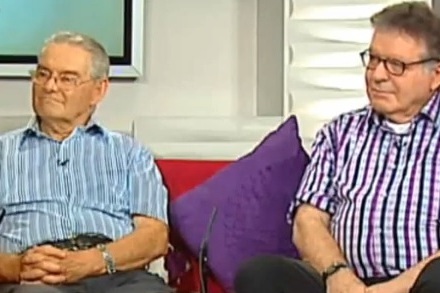 On Wednesday August 7th 2013, Tomi Reichental and Yanky Fachler appeared on TV3’s “The Morning Show” to discuss the importance of continuing the pursuit of Nazi war criminals. The interview began with Tomi telling Clair Brock of his earliest memories as a 7-year-old child growing up in pre-war Slovakia where his father was a famer and his grandfather was the local shop keeper. He was not particularly aware of the impending danger faced by much of the Slovakian Jewish Community, in that his father was regarded as necessary to the local economy and therefore was not deported as early as many others in the community at that time. The head of the fascist Slovak state was a Catholic monsignor, and Slovakian Jewry was the first to be deported to Auschwitz from about March 1942 onwards. Tomi was eventually expelled from his national school and sent to a Jewish school where he was forced to wear the yellow star. Tomi now discovered the sharper end of anti-Semitism including verbal and physical abuse from other children. Tomi also speaks of those who helped him and his family, including the local Catholic priest who organised forged papers and taught the children how to pass for Christians. Yanky Fachler is well known in Ireland and abroad as an authority on the history of the Holocaust. Yanky lost his grandparents along with a significant number of members of his family during the period 1939/45, and has been to the forefront of Holocaust remembrance and education in Ireland. In this interview, Yanky stressed the continued need to bring the perpetrators of the Holocaust to justice, irrespective of rank. Yanky says that the time that has elapsed since the crimes committed during the Holocaust is irrelevant. Too many of those responsible slipped through the net, but this does not diminish our responsibility to prosecute the few perpetrators who are still alive. An interesting point raised in the discussion is the fact that there is no legal provision in US law to allow the prosecution in the USA of a Holocaust-related crime committed in Europe. The only way that perpetrators who may be living in the US may be tried for their crimes is on foot of extradition proceedings to European countries, which in many cases is fraught with legal uncertainty.